Trekking in Jordan is an unforgettable experience. Our Jordan trekking holidays are carefully designed to take you into the wildest and most beautiful landscapes in the country. These treks are all on foot, but with the support of a crew who will transport baggage, handle camping equipment, and prepare meals, leaving you free to enjoy Jordan's wonderful scenery and historic sites. 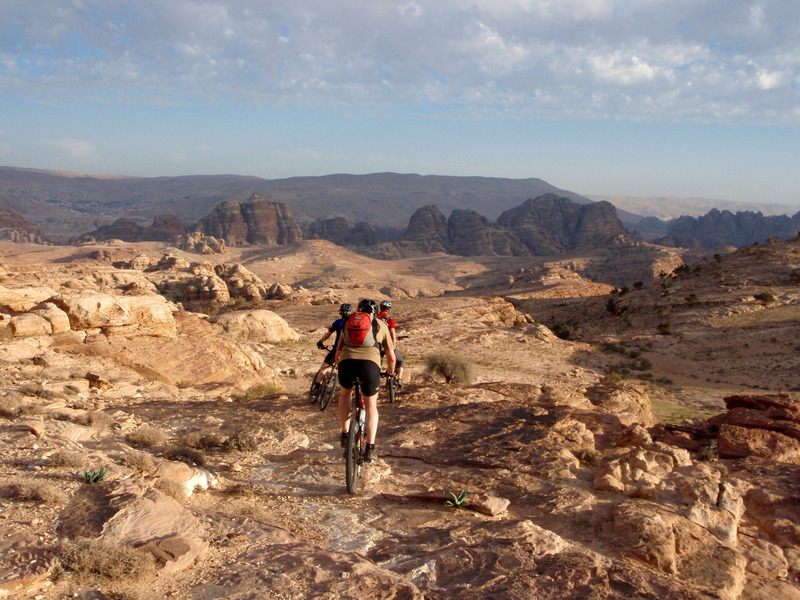 Jordan is a fabulous cycling destination - quiet back roads, dramatic views, and world-class historic sites. Our biking tours will take you through Jordan's most spectacular landscapes and introduce you to the country's ancient cities, delicious food, and welcoming people. Our Jordan cycling tours include new bikes, professional guides, and beautifull designed itineraries. Jordan is a fabulous hiking destination - from the green Mediterranean hills of the north to the desert wilderness of Petra and Wadi Rum, our hiking trips will take you through the country's most beautiful landscapes and introduce you to Jordan's historic sites, friendly people and excellent food. All our hiking itineraries have been carefully designed, from gentle one-day walks to adventurous week-long treks. Welcome. Wadi Rum is one of the most spectacular desert landscapes anywhere in the world, a wilderness of red sand dunes and rock formations that leaves a deep impression on everyone who sees it. 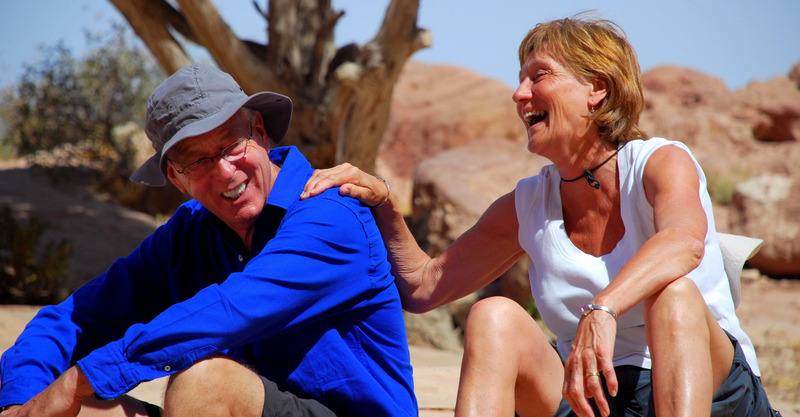 All our Wadi Rum tours are designed to give you a feeling for the spirit of this special place. Explore the desert by jeep, camp out in the sands, hike or climb the mountains, or take a camel or horse trek. You can even go up in a hot air balloon. 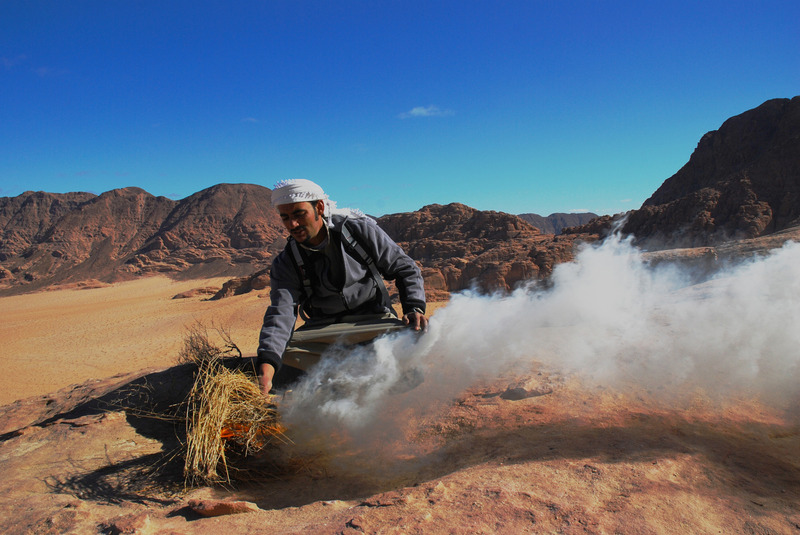 These trips are guided by our friends, the indigenous Bedouin people of Wadi Rum. Jordan is home to some of the greatest historic sites and most beautiful desert landscapes in the Middle East. Our sightseeing tours are designed to help you experience the very best Jordan has to offer. Explore Petra in your own time, discover Jordan's Roman cities, and take in its most beautiful scenery, from the red sand dunes of Wadi Rum to the green Mediterranean countryside of the north. Wherever your Jordan tour takes you, you will be warmly welcomed by the Jordanian people. All our Jordan family holidays are designed with the enjoyment and safety of families in mind. We make sure that the hotel rooms are perfect, that the vehicles have the right car seats for the kids, and that the activites are always fun and family-friendly. Some of our great family activites include camping out in the desert, cooking with the locals, exploring marine life, visiting an interactive childrens' museum, riding a camel, and - of course - learning about the lost city of Petra. 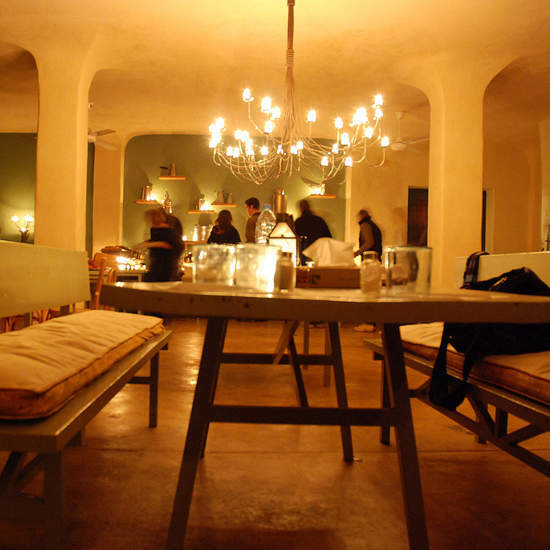 These are exciting, carefully-designed holidays that you'll remember for years to come. Explore the hidden landscape of canyons that wind down from the high plateau of the eastern desert into the Wadi Araba. 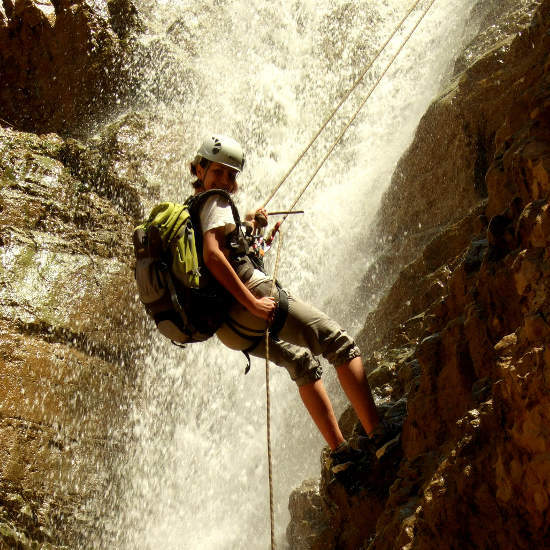 Our canyoning Jordan trips will take you safely down into a secret world of eroded sandstone, strange rock formations, flowing streams, rare plants, and beautiful waterfalls. From the spectacular Wadi Mujib to the hot streams of the Wadi Ibn Hammad, we'll move through these ravines by hiking, wading, scrambling, abseiling, jumping, climbing, and swimming, and emerge at the other end tired but exhilarated. 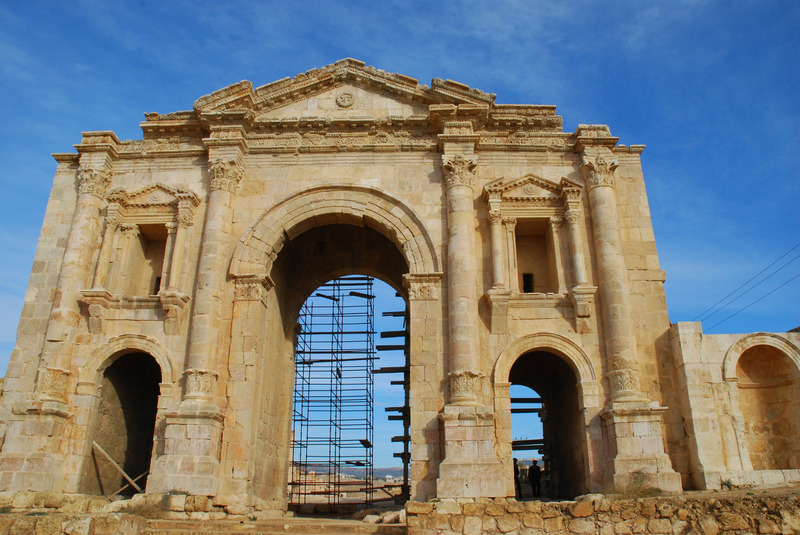 Our luxury adventure trips for Jordan provide a high end experience of Jordan. You get to experience exciting activities, exciting places like Wadi Rum and Petra Jordan, indulge in nature and experience the luxury accommodations of Jordan. Although many of the accommodations included in our Luxury adventure programs are five star hotels or resorts you will also experience camps and lodges that enrich your adventure. 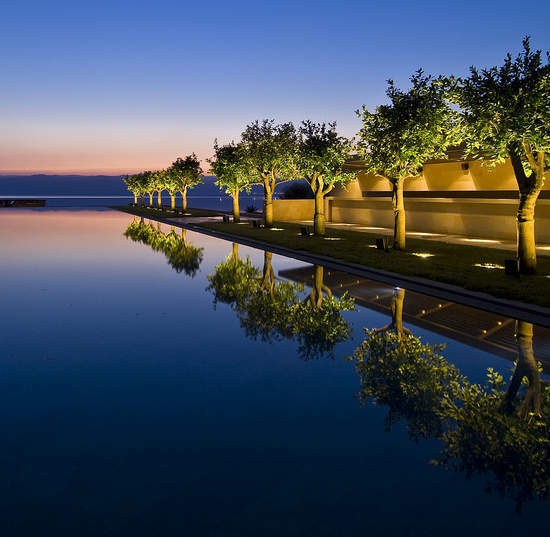 Jordan is a fabulous honeymoon destination - magical desert scenery, gorgeous resort hotels, memorable adventures. We've designed these Jordan honeymoon tours to offer you a perfect blend of romantic, secluded hotels and adventurous, active exploration. Camp out in the desert, swim in the clear warm waters of the Red Sea, hike the secret route in Petra. Welcome!